Carol, Dave and everyone else, Happy New Year 2019 !! Wanted to share the great news that I ended up working with Nat Geo Wild on a recently released/aired "Big Cat Weekend" documentary on Patagonian Pumas. It's part of an annual initiative from Nat Geo Society to spread the message of conservation and protection of Big Cats around the world. Please check it out, it has some incredible footage, especially of Pumas feasting on Penguins in Patagonia ! This does not seem to be the only time I might end up working with NG and NGW teams ! Last edited by kiran on Thu Jan 03, 2019 11:09 am, edited 1 time in total. A beautiful and unique scene. Congrats on your work with NatGeo! Look forward to more. Congratulations, Kiran! What wonderful news to hear of your work with National Geographic, and with your talents its very well deserved. 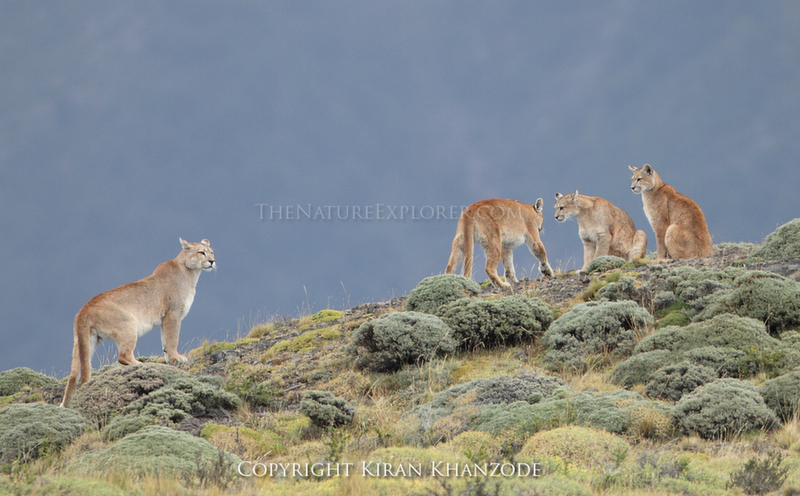 This is an amazing sighting of the Patagonian Pumas with four in the frame, and you got a superb image here with them beautifully lined up along that strong diagonal ridge. Well done! Wishing you a Happy, Healthy and Wonderful New Year, and may 2019 take your dreams even further. I tried the link but it is restricted over here in the UK. Congrats on the Nat Geo assignments A compelling image! what fabulous news to hear Kiran. Congrats on the Nat Geo documentary. Wow! Gotta say well deserved. Fabulous image BTW, and many thanks also for your kind words. Striking image. All pumas are lined up very nicely with great habitat. Thanks a lot, Joe, Carol, John, Dave and Paul !! Appreciate you taking the time to comment. Congrats Kiran on the EP. Inspiring! Oh wow, this is insanely good and fortunate!!! Thanks, E.J. ! . NSN has been THE launching pad where I found the motivation and inspiration this past decade+. Thanks to all of you !! Superb! Big congratulations on you work! Thank you , Cynthia ! !